Gold Plated & CZ Floral Petal Stud Earrings Just $6.99! Down From $199.99! Ships FREE! You are here: Home / Great Deals / Gold Plated & CZ Floral Petal Stud Earrings Just $6.99! Down From $199.99! Ships FREE! Tanga has these Gold Plated & CZ Floral Petal Stud Earrings for just $6.99 (Reg. $199.99)! 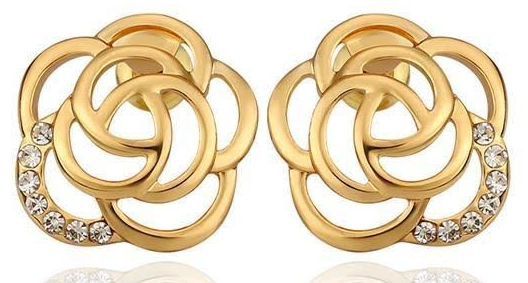 These gorgeous earrings are made in gold plated brass in the shape of a blossoming flower. Each pair is set with sparkling CZ rhinestones for an added flair. A must-have piece to add to your collection!